Functional genomics have gained its power, when regulatory sequences of genes, largely embedded in non-coding sequences of a genome, became accessible to functional assessment. 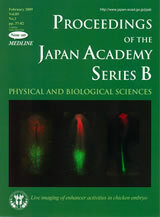 One breakthrough was made by H. Kondoh’s group, who developed a method to systematically screen for the regulatory sequences utilizing electroporation technique in chicken embryos. The method assures gain- and loss-of function of certain genes in living embryos, and has now been used world wide in the field of developmental biology. Kondoh’s group has successfully applied this method to investigate regulatory sequences of genes involved in developmental processes. 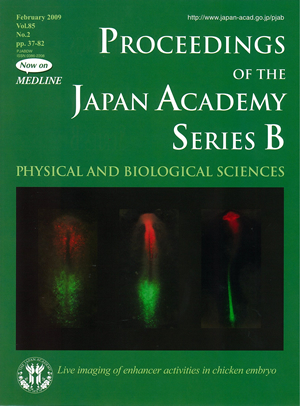 The cover illustration represents three developmental stages (stage 6, 8 and 11) of the same electoporated- embryo that developed under a culture condition, and show activities of two enhancers N-1 (green fluorescence of EGFP) and N-2 (red fluorescence of mRFP1) that regulate Sox2 expression in the forming CNS in the posterior and anterior territories, respectively, of an embryo. Fluorescent images are overlaid on darkened bright-field images of the embryo.